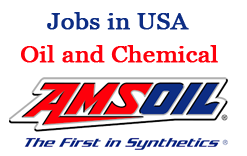 Home > US Jobs > Jobs in USA - AMSOIL (Oil and Chemical) -Apply Now! Jobs in USA - AMSOIL (Oil and Chemical) -Apply Now! Though the company was founded in 1972, the story of AMSOIL INC. begins in the mid-1960’s, when Lt. Col. A.J. "Al" Amatuzio, a jet fighter squadron commander, was impressed by the superb performance of synthetic lubricants in jet engines and began considering their possible automotive applications. In 1972, after an intense period of research and development, Amatuzio introduced the first synthetic motor oil to exceed API automobile service requirements. Since 1973, the company has seen rapid growth and constant change. Fundamental to this great success is a commitment to quality and constant improvement. As the years passed, an increasingly broad range of automotive and industrial lubricants and filtration equipment was developed, with each new product exceeding industry performance specifications by a wide margin. In addition, the ALTRUM division of personal care items and household products were created, and the AGGRAND line of natural, organic lawn and garden products followed.